The Lambretta emerged from the rubble of World War II Italy to become one of the most iconic and recognisable scootes in history. That history begins with steel tubing and allied bombs. Ferdinando Innocenti built a steel-tubing factory in 1922 in the industrial areas of Rome. By 1931, he had moved to the industrial heartland of Italy, Milan, where he built a bigger factory. Steel tubing is always in demand and his factory did well, until the Allied invasion of Italy during World War II. The British and American generals identified Innocenti’s factory as crucial to the war effort and bombed it into smithereens accordingly. Innocenti was not a man to be put off by the complete destruction of his business by enormous explosions, however. He was determined to rebuild, but not for steel tubing. When British paratroopers had dropped on Rome during the war, they had dropped in with American scooters to help them get around quickly and easily. During the occupation by the Allies, thousands of these scooters were imported for the troops to use and they became popular with the locals. Italian motorcar production had been almost completely halted and what cars were available were very expensive, so scooters were a cheaper and easier alternative. Seeing an opportunity to make his fortune, Innocenti devised a plan to make an affordable, tough, and practical scooters for the Italian population. He wanted it to be fast, easy to maintain, seat two people comfortably, keep the riders clean from dust and water, and be easy to ride for men and women. Already responsible for the first modern helicopters, D’Ascanio was employed by Innocenti to design what would become the Lambretta. D’Ascanio famously did not like motorbikes and took the design of the Lambretta as far from one as possible. He put a protection shield on the front to keep the riders clean and dry. The pass through leg area was for people wearing dresses and skirts to mount and ride comfortably and modestly, and the front fork made changing the wheels easy. Alongside a few other technical innovations, the Lambretta was a remarkable departure from what had come before. Here was an egalitarian vehicle, designed for the freedoms that young women were embracing in modern Italy. It kept the riders clean and dry, it could go fast (especially if you tinkered with it), and it was fun to ride. Before the Lambretta went into production, Innocenti and D’Ascanio quarrelled and the general left for a competitor, taking his designs and turning them into the other classic Italian scooter, the Vespa. The Vespa came out a year before the Lambretta and inspired its own devoted following but was outsold by the Lambretta for a long time. By 1946, Innocenti had employed two aerospace engineers to complete the design and put it into production. The Lambretta was named after a local legend of the water-sprites that lived in the Lambrate river nearby. It was an immediate success but production was dogged by problems and inefficiencies. By the early 50’s, Lambretta’s were being made across the world. In Spain, Argentina, Brazil, Venezuela, India and America, the Lambretta found devoted followings amongst the poor and travel hungry. When production finally got up to full capacity, they were selling by the hundreds of thousands. In a few short years it transformed from a utilitarian workhorse into a style icon that would endure until the present day. Early Mods (originally people who listened to modern jazz, eventually evolving into a broad term for a certain look and style) took up the Lambretta and the Vespa, added millions of wing mirrors, painted them with RAD roundels and Union Jacks, and a classic look was born. At the same time as the Lambretta was gaining cult status with the Mods in England, the rise of the cheap modern car was killing off the core market for the scooters. More people could afford small cars, which were more practical and safer than Lambrettas (not to mention warmer), so they made the obvious choice. Lambretta continued to make innovations and new models throughout the 60’s, but the momentum that brought them to world wide fame was dying. By 1972, Innocenti had stopped production. They had been bought by a large company who did not foresee the changes to come in the motor industry. Strikes and falling sales did for Innocenti, even in emerging markets like India, where cheaper Japanese motorcycles were better choices for consumers. The Indian government bought the rights to Innocenti products and made them until the late 1990’s. 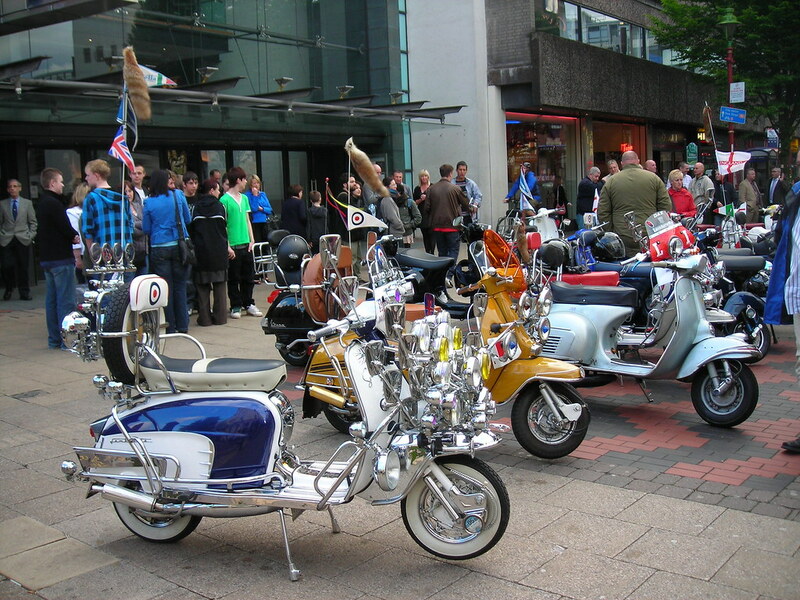 Scooter and Lambretta clubs are still popular in Britain and around the world and original Lambrettas drive a fair price at auction.